The Wall Street Journal has the startling news that “Most Marketers Don’t Understand Automated Ad Buying.” Ten years into the programmatic revolution and most marketers don’t understand it! ANA Chief Executive Bob Liodice is quoted, saying “confusion about how the technology works might be slowing its adoption.” Are we failing? It’s almost certainly true, as Liodice says, that confusion about programmatic is slowing its adoption. I believe this because it has also been true of every non-lethal technology in history1. It takes time for new technologies to win the market, and different customer sets adopt them at different rates. Everett Rogers wrote about this back in 1962. In an idea made famous by Geoffrey Moore in Crossing the Chasm (required reading), he argued that it takes a certain amount of time for innovations to spread. Every business person has seen the pictorial representation of this idea, distilled into the chart on the cover of Moore’s book. It shows how innovations spread: from Innovators to Early Adopters to Early Majority, etc. Back to the WSJ article. The WSJ based its argument on a poll. 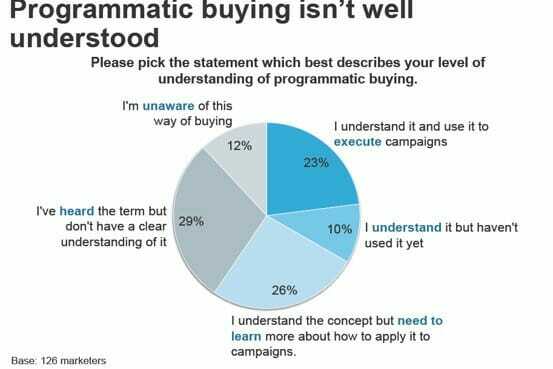 The poll shows that only 23% of CMOs are using programmatic and that only 33% understand it well enough to apply it. In contrast, 44% don’t understand it or are not even aware of it. I know that sounds bad, but before we worry, let’s compare the self-reported to the theoretical–let’s see where on the diffusion of innovations curve we are. 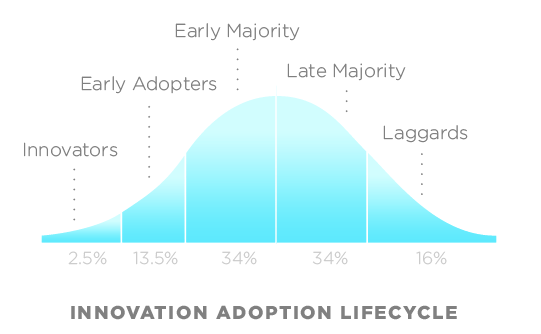 Here are the poll results superimposed on the Innovation Adoption Lifecycle curve. In the adoption of programmatic ad buying, we’re past the innovation stage, we’re past the early adoption phase, and we’re well into the early majority phase. That we’re in the early majority phase is important, because these are the customers that are using the technology not because they like the new new thing and not because they are willing to take big risks to get big rewards, but because they are pragmatists: they make business decisions based purely on what is best for their business. As such, they are trusted by everyone else in the market, and what they do carries enormous weight as others make their decisions about whether to use the technology or not. Just as the visionaries drive the development of the early market, so do the pragmatists drive the development of the mainstream market. Winning their support is not only the point of entry but the key to long-term dominance. We don’t have to worry about the late majority, if we serve the early majority they will come. While it’s true that there are people who don’t understand programmatic ad buying, we are past the point where that matters to our chances for success. We may not be satisfied until everyone is a customer, but once we’ve gotten the early majority we know we’re already on that road. Radical change creates reactionaries. And the media loves the story that reactionaries tell, it creates the appearance of conflict without the discomfort of real conflict: it’s entertainment, pure and simple. In the real world the conflict is over, programmatic has won. If you answered the poll with “need to learn more”, you probably mean that you want the technology to be a bit more mature before you implement it. And that’s okay, your business may punish mistakes more than it rewards success, so waiting until programmatic is how the majority buys is better than sticking your neck out, career-wise3. But if you’re one of the people who “don’t have a clear understanding”, or is “unaware”, take some time to remedy it. This technology is on its way to long-term dominance. Marketing is about creating and embracing change, time for you to do some embracing yourself.